Britain has already declared its support for the creation of a Jewish homeland in Palestine. Now leading Zionists address the Paris Conference in support of their plans, including the well-connected Chaim Weizmann and others from Eastern Europe, who remind delegates of the horrors being experienced by their fellow Jews there (where the massacres at Lemberg and more recently Proskurov have already shocked world opinion). In his presentation and his private discussions with world leaders, Weizmann is deliberately vague as to the political arrangements that will apply in this Jewish homeland; he is careful not to refer to a future Jewish state or even to the prospect of Jews becoming a majority in Palestine. American Zionists are more uncompromising in this regard, but their representatives have not arrived in Paris yet, so Weizmann’s more subtle approach carries the day. Weizmann does not however have things completely his way. French Zionist André Spire also addresses the conference, suggesting that France’s ancient links to the Holy Land mean that it rather than Britain should be the mandated authority in Palestine. And to Weizmann’s chagrin, the French-Jewish scholar Sylvain Lévy affirms that, like the majority of French Jews, he is not a Zionist at all. He suggests that Palestine would not be able to support the Jewish population of Eastern Europe, should they all move there, and fears the consequences for diaspora Jews if, as some Zionists have suggested, they were to be given a share in the governance of Jewish Palestine. This all causes Weizmann to whisper to Lévy that he is a traitor. No decision is reached today on Palestine. And, naturally, the people currently living there are not invited to send representatives to the conference. Today it is the turn of the Armenians to make their pitch to the Paris Conference. Somewhat unusually, they are not seeking their independence but rather for a big Armenia to be created as a mandate of the United States. The Armenians have suffered terribly at the hands of the Turks, who sought to exterminate them during the war, and they are fearful that a resurgent Turkey might attempt to finish the job. They also have Russia to their north and fear that without an external patron they will be invaded by either Turkey or the Red Army. Unfortunately for the Armenians, the Americans are not keen on acquiring a dependency in the Caucasus. Any responsibility of this kind would be difficult to sell to the American public, making it unlikely that it will be included in the peace settlement. Britain has found itself in a bit of sticky wicket in the Middle East, where its contradictory promises to the French and the Arabs are now coming home to roost. Today the awkwardness is laid bare when Emir Faisal appears before the Paris Conference to advance the claims of his father, Sharif Hussein of Mecca (self-declared King of the Arabs). Faisal does not speak English, but he has the British intelligence officer T. E. Lawrence to translate for him. Faisal is seeking the Arab kingdom promised to his father, a greater Syria that would stretch from the Anatolian border all the way down to the Arabian peninsula. This unfortunately clashes with French ambitions in the Middle East and the Sykes-Picot agreement on the region’s partition. The French have a particular attachment to the area around Mount Lebanon, where francophile Maronite Christians live, and are keen both to create a larger Lebanese entity under French control and to use this to expand into Syria proper. As can be imagined, the French are hostile to Faisal’s presentation. Wilson is curiously indifferent. The British meanwhile are in an embarrassing position. They would like to support their Arab client, but they dare not risk a rupture with France. If they have to choose, then Faisal will be disappointed. 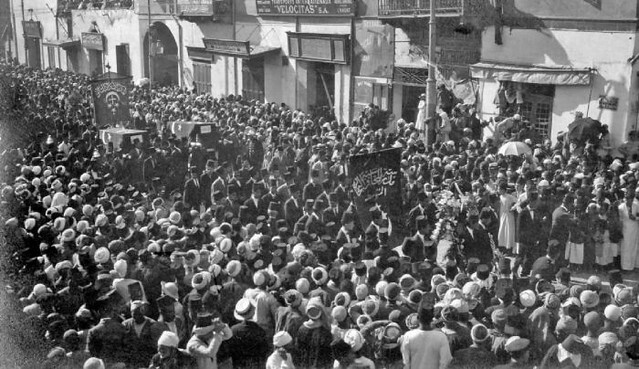 Sharif Hussein of Mecca revolted against his Turkish masters in 1916. With British help his supporters soon managed to secure Mecca and most of the Hejaz region before advancing northwards into Syria. However, they were never able to capture Medina, which was strongly defended by Fahreddin Pasha, a tough Turkish general. The Arabs were not strong enough to storm Medina. Nor were they able to enforce a blockade of the town: even with intermittent Arab attacks on the railway to Medina, Fahreddin’s garrison remained in supply. When Turkey’s representatives signed an armistice with the Allies at Mudros, Fahreddin still refused to surrender. Now though, more than two months later, the Medina garrison finally capitulates, the last Turkish army to lay down their arms. Fahreddin’s surrender is accepted by Sharif Hussein’s son Abdullah. The war has ended in the Levant but large number of Allied troops remain in Syria and Palestine. Some of these will be here for some time yet as enforcers of the British or French suzerainty that is succeeding Turkish rule. Most of the Allied troops are however slated for demobilisation, but a shortage of shipping means that the soldiers cannot be transported home just yet. Relations between the Allied troops and the local Arab population are not always warm. Incidents of thieving and pilfering by rowdy soldiers and light-fingered locals combine with racist assumptions to exacerbate tensions. A particularly unsavoury incident occurs today at the Palestinian village of Sarafand, south of Jaffa. Believing that one of their comrades had been murdered by Palestinian from the village, New Zealand troops first formed a cordon around Sarafand and then stormed the village. After driving out women, children and elderly men, the New Zealanders then set upon the remaining menfolk of the village with cudgels and bayonets. Several dozen Palestinians are killed, possibly more than a hundred. Allenby, the British commander, is furious when he learns of the massacre. However, the New Zealanders and other nearby units refuse to co-operate with inquiries into the matter, making it impossible to identify the individuals responsible. The ANZAC murderers remain unpunished. 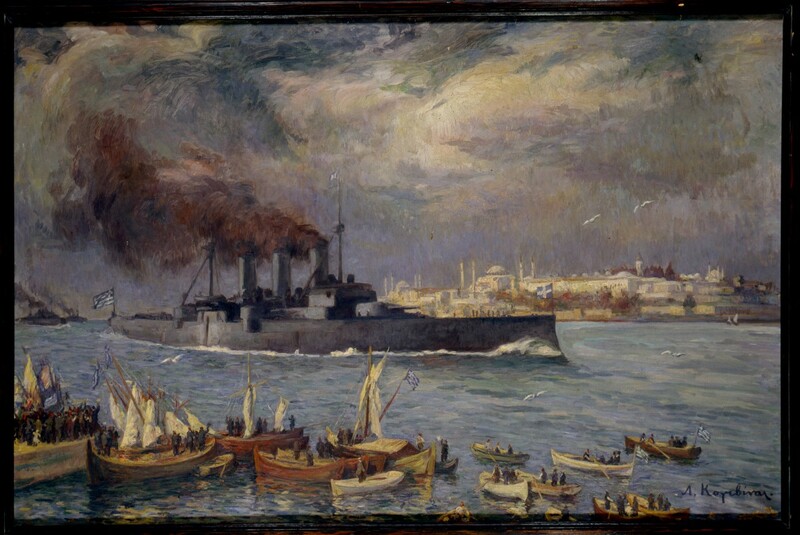 In 1915 an Allied fleet attempted to sail through the Dardanelles and then on to Constantinople, thereby opening a naval trade route to Russia and perhaps knocking Turkey out of the war. That attempt failed, setting the stage for the disastrous Gallipoli campaign. At the armistice of Mudros however the Turks agreed to the occupation of their capital. Today an Allied fleet sails unmolested to Constantinople and lands troops in the Sublime Porte. This is the first enemy occupation of Constantinople since the Fall of Byzantium in 1453. As a show of strength, Allied aeroplanes fly over Constantinople. Allied troops also parade through the city accompanied by marching bands, where they receive a warm welcome from the city’s Christian inhabitants. One aim of the Allies is to bring to justice the perpetrators of Turkey’s campaign of extermination against the Armenians of Anatolia. Unfortunately Turkey’s leaders in the war and the main architects of this campaign, Enver, Talaat and Djemal, have all fled the country to Germany, so the Allies will only be able to deal with persons lower down the chain of command.